Logo water bottles are a brilliant promotional product. You get great brand visibility because bottles go everywhere. They’re taken to fitness classes, shown off at the gym, attached to bikes, and even used in the office. Not only is use frequent, but it’s long-term - especially if you go for a durable aluminium water bottle. Drinking water is good for you. Giving away a water bottle shows you actively promote healthy-living and responsible exercise. It sends the message that you care about the health and well-being of your clients and staff. Making sure they stay hydrated and get their 2 litres a day. Re-useable logo water bottles show you’re an environmentally conscious company too. Every year over 580,000 tonnes of plastic is used to make disposable bottles. Half of this ends up in landfills. With this promotional gift you’re helping to reduce landfill waste, and advertising your business at the same time. Give your members a high-quality sports bottle, they’ll be highly delighted…and so will you. While they’re out and about, cycling through town, pounding the pavements, or even at work…they’re promoting your gym or club, and selling your membership for you. Your health-conscious customers will know that drinking lots of H2O is vital to well-being. So they’ll certainly thank you for a reusable water bottle to stay hydrated. Give away as a promo on nutritional drinks and juices, so they can get a vitamin and mineral boost while on the go. Free gifts are a great way to entice people to buy from your store, especially in the competitive online marketplace. Logo water bottles are a relatively inexpensive way to boost your sales, with the added bonus of long-term exposure for your business. A logo water bottle is a great office promotional product, enabling staff to bring their own drinks, rather than buying from convenience stores. They’re carried in the car, taken into meetings, sit at the desk, then to the gym after work - giving you great visibility. Plastic bottles are light-weight, easy to clean, and available in a wide variety of shapes, sizes and colours. They’re inexpensive too…allowing you to get more for your money. Plus you’ll have more choice when it comes to colour and printing. If you want a complex logo, branding or marketing message printed, plastic offers much more flexibility. Aluminium bottles are trendy, super-light, and impact resistant. And they don’t retain odours like plastic - no matter what flavoured soft drinks are put inside, they’ll always taste great. Aluminium is also an eco-friendly choice. It’s more robust therefore lasts longer than plastic, plus the material is fully recyclable. We carry a full range of logo water bottles, ready to be customised with your brand. In your search for wholesale gifts remember that quality counts. Firstly, you want the item to make the very best impression. And secondly, something of better-quality will be used more often, for a longer period of time. Our entry-level logo water bottle is a bike-style plastic drinks container with a pull-up cap. 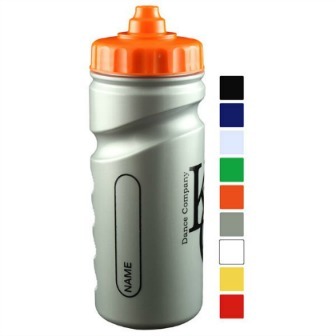 The 500ml Promosafe sports bottle made from partly recycled material and available in a wide range of colours, from £1.45 per unit with 1 colour printing. We offer a retro-style milk bottle which holds 475ml, in translucent plastic with your choice of lid colour in red, blue or black, from just £2.73 including a single colour logo design. Our stylish 500ml aluminium drinks bottle with screw on cap and carabineer makes a great corporate gift. It’s available in a choice of colours to complement your brand including silver, amber, blue, gun metal, green, pink, red and white. Buy wholesale from £2.43 including 1 colour print, can also be engraved. 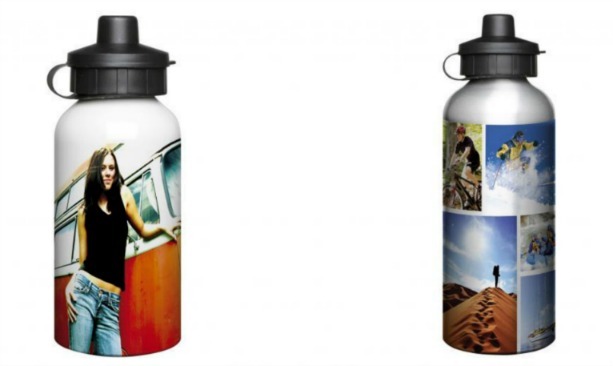 Alternatively the 400ml or 600ml capacity aluminium sports bottles with black screw cap and covered sipping spout, that can be printed with a full colour image, from only £6.35 each, these make a truly impressive gift with high impact branding. Choose our high-quality Cherub aluminium sports bottle, with a trendy design in gun-metal grey. It holds 750ml and has a large fold-out straw, priced at £3.71 including logo printing. Our luxury Hammond Bottle is made from stainless steel and shaped to resemble of a bottle of Evian - so it’s perfect for the office, priced at £5.09. We offer reusable roll-up logo water bottles with carabineers in a myriad of colours. There are 9 to choose from including amber, pink, purple and red, from £1.23 with 3 spot printing. Also available in metallic shades. If you’re in the sports business, we have a complete range of promotional gifts including safety reflectors, pedometers, calorie counters, t-shirts, gym bags, holdalls, silicon sports watches and golfing merchandise. All customisable with your logo and message.